What is the Difference Between Buffing and Polishing a Floor? Commercial cleaning processes typically are a lot more in-depth than our personal home cleaning, and it’s no wonder — when you have thousands of square feet of floor to clean, and your reputation could depend on the overall cleanliness of the building, you’re going to want to do a great job. So when it comes to cleaning floors, how are you to know what the various processes are and how much they cost? There’s spray buffing and then there’s polishing, more technically known as burnishing. Read on for more information. Concrete floors, in particular, are quite durable but also vulnerable to small nicks, smudges, and scratches. A concrete floor buffer is the best solution for cleaning your concrete floors. Polished concrete floors can look quite modern and can have a minimal maintenance cost, so that’s why they’re not a bad solution when it comes to deciding on flooring type. You may hear people talking about buffing a floor versus polishing a floor, but the truth is that both types of cleaning are somewhat similar because they essentially change the nature of the surface of the floor as they clean. Buffing or spray buffing, uses a buffing machine with rotating pads that move at a slower pace. With the spray bottle, you are spraying the solution to fill in those nicks or smudges, and buffing it in and creating shine. Floor buffers are typically equipped with buffer pads that are specially designed to take out scuffs and other types of dirt or marks to create a more even shine. Polishing, or burnishing as it’s more technically called, is not as common as spray buffing. A burnishing machines moves at a much faster pace than buffing. With burnishing you’re essentially taking the top layer off the floor, to even out the floor and create a shine. Just like a buffer, a floor polisher creates a smoother surface on a floor so that it looks cleaner and shinier. Polishing may change the quality of the material by, for instance, adding an extra substance to protect it. They both leave the floor shinier overall. Any type of floor that has polymer gets little dents in it which leads to a less shiny appearance, which looks dull and unclean. Floor buffing involves using a buffing machine to smooth out the surface. Is There a Difference between Polishing and Buffing? 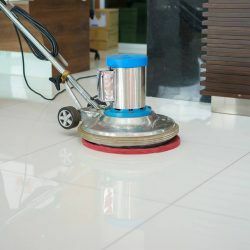 Floor polishing or burnishing and buffing are often times used interchangeably, but polishing uses a heavier process to clear away bumps and chips. At an industrial level, both of them get rid of chips and pits, and both require specialized machines and care, especially for floors made of delicate material. If you want to know whether your floor needs buffing, polishing, or both, a certified commercial cleaning company will be ready to help you figure it out. JAN-PRO is the #1 rated commercial cleaning franchise in Canada, #1 low-cost franchise, and #1 home-based franchise. To find out more about us and the kinds of services we offer, call or message us to Get Your Free Quote Now.